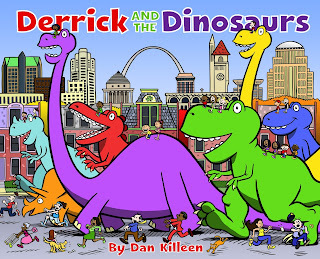 The Newest Rant: A Review and Overview of the Storybook, "Derrick and the Dinosaurs"
A Review and Overview of the Storybook, "Derrick and the Dinosaurs"
I met Dan Killeen at the first-ever Saint Louis Comic-Con a couple months ago and picked-up his storybook, "Derrick and Dinosaurs," because as someone who loves good artwork and dinosaurs it sounded right up my alley. A book geared toward smaller children, there still is plenty of fun jokes and neat references to local Saint Louis landmarks that grown-folk will enjoy the book too--I know I did! 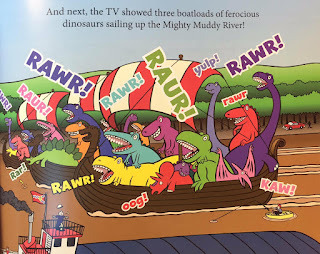 The story centers on a young boy named Derrick who has an obsession with dinosaurs that doesn't just border on unhealthy, it crosses that line and eagerly stomps on it while yelling, "Rawr!" 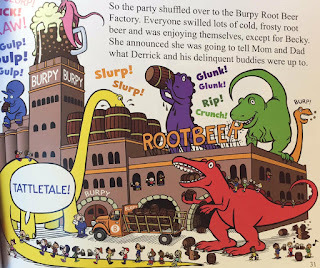 You see, Derrick decorates his room with dinosaurs, only plays with dinosaur toys, exclusively eats cupcakes and drinks root beer (as he heard dinosaurs like those food items), interrupts his classroom with dinosaur-yells, and otherwise behaves in a manner that upsets everyone around him. It all comes to a head when Derrick gets suspended from school for his behavior (on the day of the big field-trip downtown, no less) and is forced to put all his dinosaur-items in the basement until he can learn to behave while the rest of his classmates and sister, Becky, get to have fun on a field trip. However, a twist of fate occurs in Derrick's favor when the mayor of the city comes on all the channels to announce a local emergency. 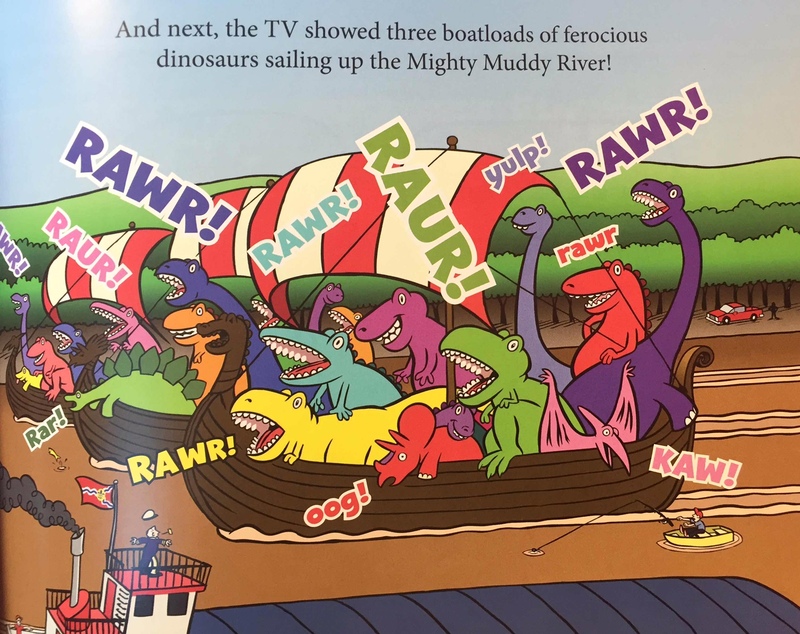 Apparently ship-loads of dinosaurs are coming down the river from Dinosaur Island with the intent to land upon the shores of downtown. The mayor describes how the populace is utterly helpless against this threat and basically tells everyone to go hide. Putting aside how it is amazing that a mayor so eager to give-up ever got elected, the town clearly faces a major threat from these dinosaurs. 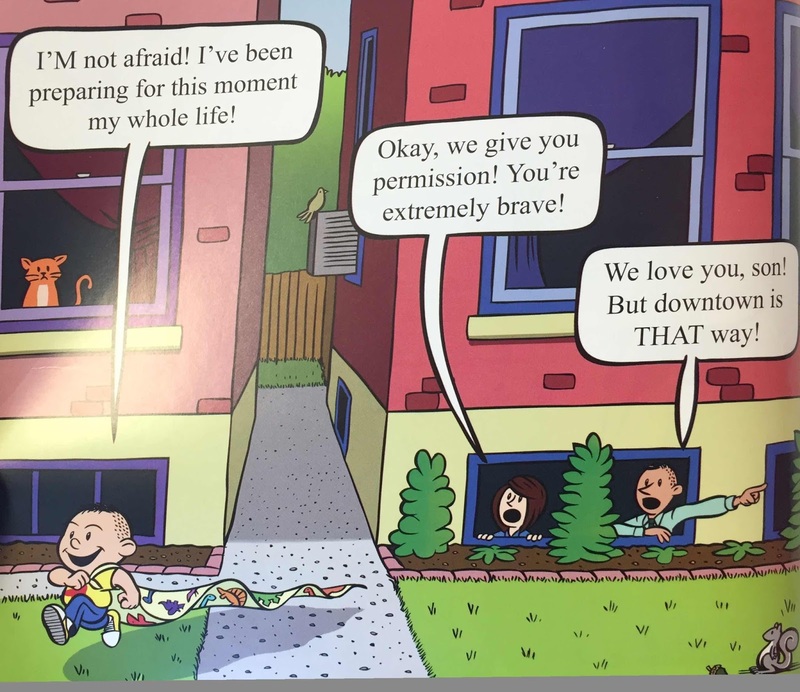 Derrick realizes probably only he can save the day and despite his parents warning him it will be dangerous, they give him permission to run downtown in an attempt to corral the attacking-dinos. At this point in the story I decided that Derrick's parents either really believe in their son, or wouldn't mind if Derrick's sister became an only child. 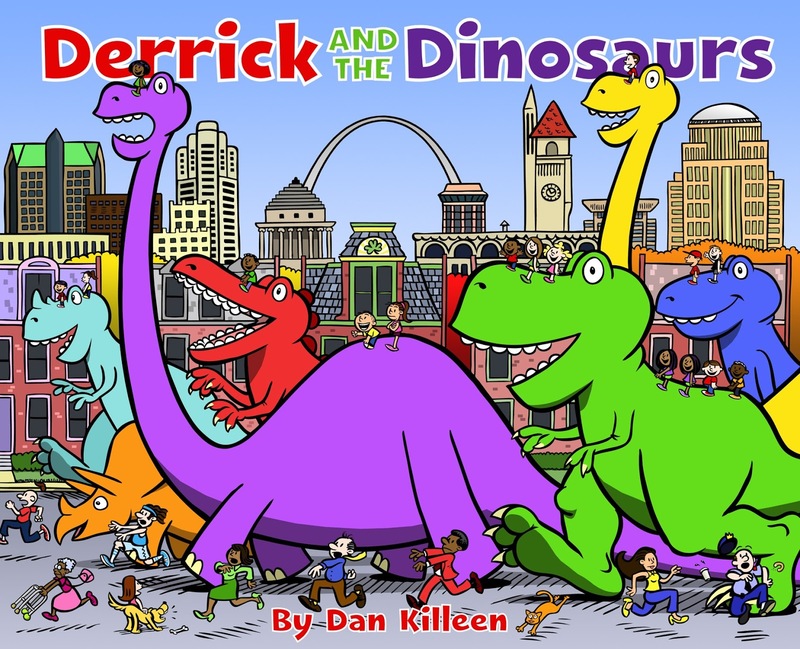 Derrick arrives downtown and upon letting-out the most impressive, "Rawr," the dinosaurs have ever heard, advises them to quit causing trouble at once. The dinosaurs convince Derrick to join them in causing a little bit of a ruckus however and they go around the city stomping on cars, invading baseball stadiums, chomping on cupcakes, guzzling root beer, and otherwise behaving in the manner you normally expect tourists to act but extra-worse. Eventually upon being scolded Derrick tricks the dinosaurs into leaving town on their boats and the mayor gives Derrick the key to the city when it is discussed how without Derrick he probably wouldn't have been reelected due to all the destruction--regardless of your party affiliation I think we can all agree this mayor was one ineffectual politician and shouldn't be in power, but so goes politics. Everything ends well with Derrick realizing he's happy as a boy who loves dinosaurs, and that he doesn't actually need to be a dinosaur to find joy. He's allowed to put all his stuff back in his room and the story concludes on that positive note--at least as long as the dinosaurs never return or develop a taste for human flesh. Kileen's artwork is wonderful, looking unique but at the same time giving off a bit of a vibe of, "Calvin and Hobbes," meets, "Peanuts," via the manner in which the human characters and dinosaurs are drawn. There is a nicely light and fanciful feel to the dinosaurs, with their love of cupcakes and root beer being a fun creative touch. I also like that the book acknowledges how even if Derrick eventually saves the day he isn't perfect--after all, for awhile he excitedly joins the dinosaurs in wreaking mayhem to a delightfully comedic effect. 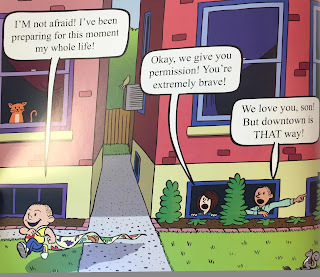 "Derrick and the Dinosaurs," is a book I greatly enjoyed and imagine any parent would have a great time reading with their child as well. You can learn more about Dan at his website and find the Amazon link for the book here.I look forward to reading other works by Dan Killeen and encourage you to check his stuff out as well!